The bow is as important as the cello itself, and without the right one your instrument will never be able to live up to its full potential. There’s a lot you need to know to make an informed decision when you’re shopping around. Finding the best cello bow for you is a process that will require testing out several bows with your instrument. Testing each one with your cello is essential. Knowing how to choose a cello bow is a process that requires research and time. Choosing the right bow for your cello is a very personal experience, and what you like could be totally different from someone else’s preferences. You have to play the bows with the cello they’re going to be paired with, or you won’t really know what type of sound it will produce. There are many theories about the origin of bowed instruments, but for centuries strings were plucked before the horsehair bow was introduced. The most popular theory is that they originated in Central Asia, where horses were an important part of daily life. Even now, much of the horsehair used to make bowed instruments is collected in countries like Mongolia. This is because hair that comes from countries with cold climates is more coarse, helping it grip strings and produce the best sound. The bow was probably spread quite easily because of Silk Road trade. The bow as we know it today was created by French bow maker François Tourte in the 19th century. Tourte is considered the Stradivari of the bow, setting an entirely new standard and design. There is a long legacy of great French bow makers that came after Tourte, but he is easily considered the best French cello bow maker ever. Many believe he is the greatest bow maker in history. He standardized the use of Pernambuco wood, originally from Brazil. Pernambuco is dense and heavy, making it ideal for playing. A cello bow by Tourte sold for $196,000 in 2007. The best cello bow makers still deeply respected today include Eugène Sartory, Albert Nürnberger, and W.E. Hill and Sons. Sartory was renowned for the consistent quality of his bows, which have withstood the test of time. 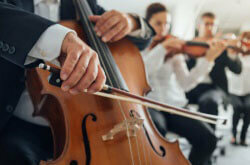 In 2011 a Sartory cello bow sold for $86,000. Nürnberger’s bows were considered as good quality as the old masters by many great musicians. The name Albert Nürnberger actually represents the entire Nürnberger family of bowmakers spanning several generations. Christian Albert Nürnberger is the last remaining family member still making bows under the name. W.E. Hill and Sons was an extremely important London-based workshop in the 19th and 20th century. One of their cello bows sold for $54,000 in 2009. Older isn’t always better, and there are many great bowmakers still living today. Some of the best modern cello bow makers include Eric Fournier and Pierre-Yves Fuchs. Their bows are expensive, but they have several models under $5,000. What is a cello bow made of? There are several types of cello bows. You have to factor in cost, environmental impact, and how you’ll be using your bow to determine the best type of cello bow for you. So much of it comes down to personal preference. There is no outright best cello bow material, but in general the two highest quality materials are Pernambuco wood and carbon fiber. If you own both an acoustic and an electric cello you might need to look into buying two different bows as well. For example, the best carbon fiber cello bow for electric cello might not perform well with your classical cello. There are two main types of wood available for bows: Pernambuco and brazilwood. For those who are unfamiliar with bows it might be confusing to learn that they come from the same tree. However, they are taken from different parts of the tree. Pernambuco comes from the heartwood, making it more dense and sturdy. Brazilwood is harvested from the less dense parts of the tree, and is considered lower quality. Pernambuco is often much more expensive, but most musicians feel it is the best wood for a cello bow. Because of its greater density it can be subject to greater stress, and is less likely to warp in shape. 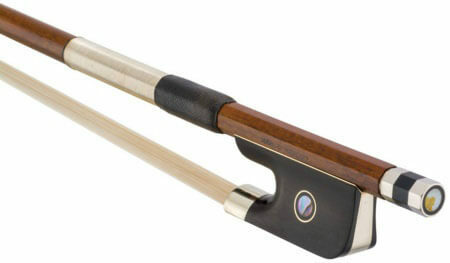 Pernambuco cello bow reviews praise its balance and strong sound. Brazilwood can produce great quality bows as well, and if taken care of can last a long time, but the best bow makers in the world almost exclusively use Pernambuco wood instead. The best Pernambuco bows can cost thousands of dollars, but there are many that are available at accessible prices that also sound great. A major concern surround Pernambuco and Brazilwood is sustainability. The trees are harvested in Brazil and due to deforestation are in serious danger. If you’re looking for newer Pernambuco bows you should do your research first to make sure that you’re using sustainably sourced product. We’ve included fiberglass for reference, but generally don’t recommend it as a good option. It is often an extremely cheap option, and holds up well, but we’d suggest an inexpensive Brazilwood bow instead if you’re on a tight budget. Carbon fiber has been taking the instrument world by storm. 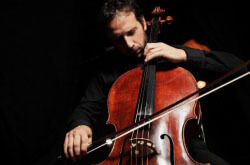 Cellos made of carbon fiber have grown immensely in popularity for their durability in all types of weather as well as their strength in comparison to wooden materials. Pernambuco bows are becoming rare due to the difficulty of obtaining the right quality of wood, and a good carbon fiber bow can produce the same quality that a Pernambuco does. Carbon fiber cello bow reviews consistently praise their comparable quality to Pernambuco. Additionally, if you’re often playing outside or in a climate that changes frequently a carbon fiber bow is a good choice because it holds up regardless of the weather. The screw is located at the bottom of the bow, near where you grip it. You turn the screw to loosen or tighten the bow hair. No one is quite sure where its name came from. The name and meaning is different in languages like German and French, but its purpose is to contain the parts that are responsible for the tightening and loosening of the bow’s hair. The frog is also helpful when gripping the bow. Traditionally the best bows are made with ebony frogs. Horsehair should always be used. Cello bows require more hair than violins, somewhere between 200-250 hairs usually. The best hair for a cello bow comes from Mongolia, where the hair is coarser and provides better grip on the strings. The stick is made from various materials, which we’ve reviewed when discussing the different types of bows available. The stick, and its material, is typically how most bows are defined. Pernambuco, brazilwood, and carbon fiber are the most common materials used. Bows, just like cellos themselves, are available in different sizes. Cello bows sizes come in 4/4, 3/4, 1/2, 1/4, and 1/8 sizes. To get an idea it’s generally recommended that 4/4 is best for ages 14 and up, 3/4 for 11-13 years, 1/2 for 8-10 years, 1/4 for 6-7 years, and 1/8 for 5-6 years old. This is based on average heights for these ages, so take that into consideration when deciding on a bow size. Cello bow lengths also vary by size. A full size bow is 28 inches. Always try them out, and if you’re shopping in person you can get assistance if you aren’t certain. It’s good to know your measurements so you can come prepared when selecting your instrument and your bow. The average bow should weigh about 80 grams, which gives it good balance and ease of control while playing. 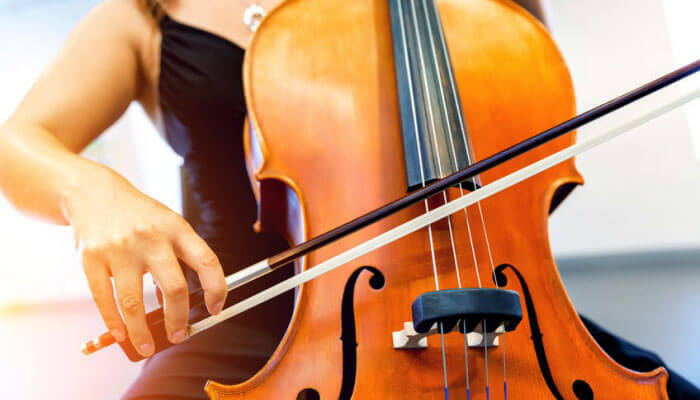 Some musicians prefer a heavier or lighter bow, and the best weight of a cello bow is one that feels right while you’re playing and gives you the most control. So what is the best cello bow? How much does a good cello bow cost? These are almost impossible questions, because a bow’s compatibility with a cello is so unique to each instrument. There are countless cello bow reviews out there, and we’ve tried to include recommendations for every budget. 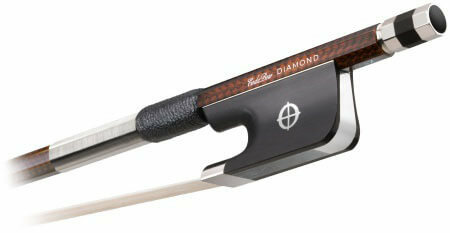 Finding a high quality cello bow shouldn’t be a difficult task, it should be a fun experience! We’ve included what we consider some of the best cello bow brands from a spectrum of price points. CodaBow has a devoted following. They are exclusively carbon fiber – the company was established by an aerospace engineer, a composite scientist, and a bowmaker. Their unique background has shaped their reputation. Coda is known for the durability and quality of their bows. They’re available at different price points: Master, Performance, and Student. 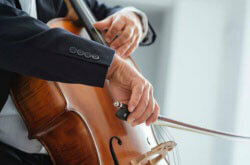 Coda makes some of the most popular cello bows available today. The Diamond NX is professional quality at a reasonable price. It’s well crafted, with an ebony frog and Moroccan leather grip. The slide is Mother-of-Pearl. The original buyer qualifies for a 10 year limited warranty. This is one of the most popular bows for more serious players, and an excellent option for anyone looking for a sturdy bow that produces good sound. 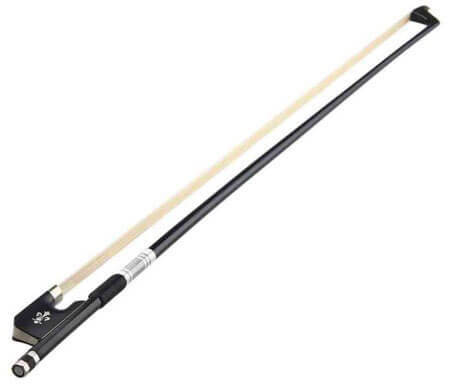 It’s one of the best carbon fiber cello bows available at a reasonable price point and possibly the absolute best cello bow for intermediate players. The Prodigy is a great bow, but with slightly lower quality materials to keep costs down. It features an ebony frog, Mother-of-Pearl slide, and nickel silver fittings. The Prodigy also comes with a warranty for the original owner, but they only offer 5 years for this model. It’s perfect for intermediate players. We think that this is the best value Coda bow for cello, and one of the best cello bows for beginners or intermediate players. JonPaul is one of the top bow making brands available today. They have bows that range in price very affordable to professional quality. Their founder, Peter Prier, immigrated to the United States from Germany and founded the Violin Making School of America. All of their bows are still made in the U.S. and provide exceptional quality at competitive prices. The company focuses on making bows that perfectly imitate the sound and standard of Pernambuco bows, and they’ve developed a loyal following for producing such good products. The Bravo model was developed for intermediate players who want a well-constructed bow at a reasonable price. It has an ebony frog and nickel silver metal components. The Bravo is comfortable to hold, making it easy to play. A professional quality carbon fiber bow, available for well under $1000, the Avanti model is excellent for its price range. This is one of the best cello bows under $1,000. It’s great for advanced players. 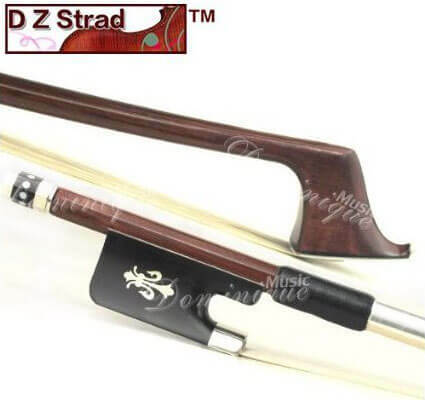 D Z Strad is one of the top cello makers in the world. 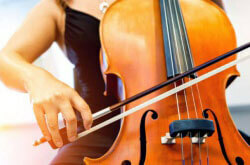 They have always offered quality instruments across a wide price range, from great beginner cellos to advanced models. Their reputation applies to their bow making as well. They offer something for everyone. The #805 is a good intermediate bow from a highly reputable company. It’s one of the best student cello bows. Reviews consistently praised the way the #805 felt while playing, with its easy grip and extra weight producing a rich sound. The #205 is a great budget choice, and is one of the best cello bows for beginners. It’s extremely affordable! The stick is brazilwood, with quality horsehair and an ebony frog. While it might seem too cheap to be a good bow, it’s perfect to pair with your beginner cello. 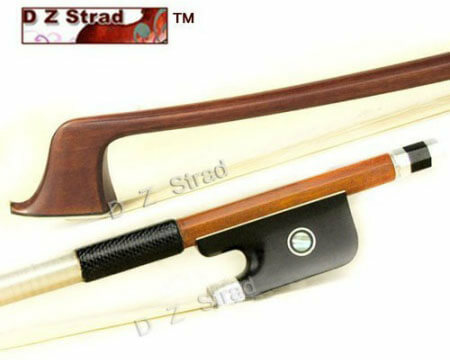 D Z Strad excellent reputation and proven quality make this one of the best cello bows under $100. Marco Raposo bows come from the home of Pernambuco and brazilwood, and are one of the first workshops to actually start producing bows in Brazil. They are focused on sustainability and the preservation of Pernambuco wood. They produce quality bows for the student market, and sell worldwide. Shar Music tested numerous bowmakers from Brazil and selected Raposo bows as their top-quality choice. The nickel mounted bow is Marco Raposo’s entry-level product. It sells for $575 through Shar Music’s website. It’s made with Pernambuco wood, guaranteeing good quality for the price. This is a good option for an intermediate player. The silver mounted bow is a step up from the nickel. It retails on Shar’s website for $925, making it suitable for more advanced players. Wooden bows often feel heavier in the hand, so if you prefer a bit more weight when you play this bow might be a good option for you. We wanted to feature one ultra-cheap brand that has some relatively positive reviews, and Kmise fits the bill. Based in Hong Kong, they offer a wide array of products. They offer bows under $50 through Amazon with consistently positive reviews. If your goal is to find the best cheap cello bow, Kmise is a smart option. The Z5248 is available for about $45, making it affordable for everyone. Obviously this bow is for beginners, and doesn’t claim to be the highest quality product on the market. However, for people on a budget the Z5248 is likely to be better than a rental or school’s bow. 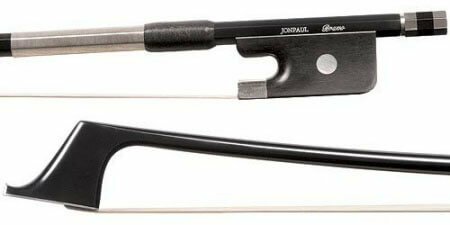 The relative quality of the materials and positive reviews make the Z5248 one of the best cello bows under $50. The bow has a rich, complex history that has developed immensely over the centuries. It’s okay to be picky when trying to find the best cello bow for the money. Regardless of your budget, take the time to test out as many as you can. In the end, once budget has been considered, go with your gut. You’ll know which bow makes your cello sing!